This pattern has been on my list for some time now, even before we found out we were having a baby. 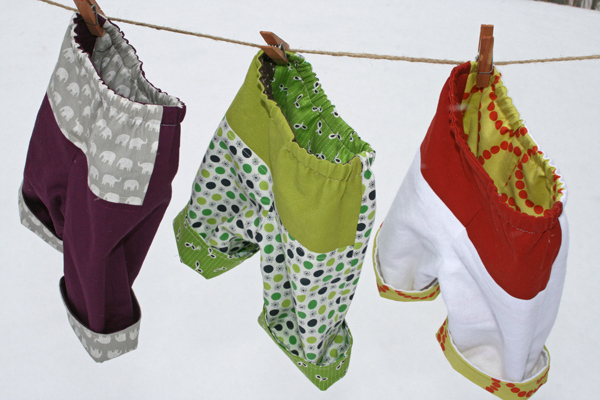 I adore teeny tiny baby clothes, and when you can make some of those items yourself? Even better! I started out with this cute pair as a test – selecting fabrics that happened to be still be sitting out on the coffee table from an order from Sew Fresh Fabrics (I won’t tell you how long they’d been there!) I love that Lizzy House print, and it happened to match quite well with the Kona Paprika I had ordered at the same time. For the inside, I used up a bit of leftover white flannel. I know, perhaps not too practical! 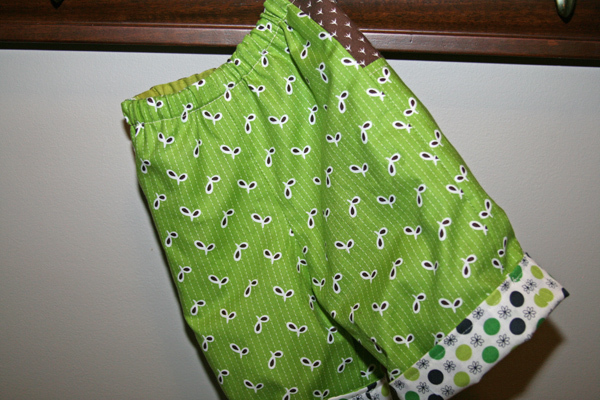 For the second pair, I decided the baby needed a little Flea Market Fancy in his life, so I went with a couple of the green prints from the line. The green seeds are paired with a fun brown print from Tula Pink’s Nest line, and for the reverse, I paired the FMF green daisy dots with a lime green Essex linen. 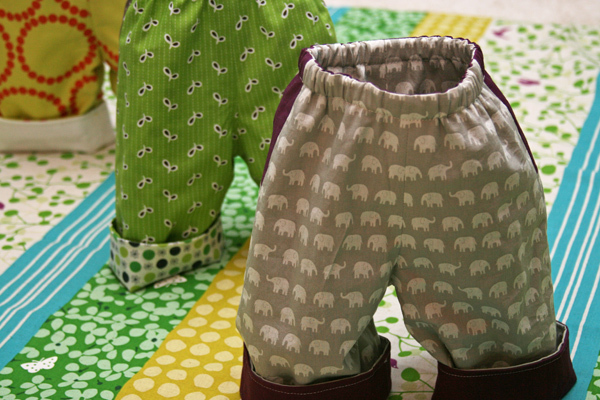 I figured I’d stop at two pairs, knowing that he’s sure to grow out of them way too fast, but after ordering these cute Tip Top elephants from Hawthorne Threads this week, I just couldn’t resist. 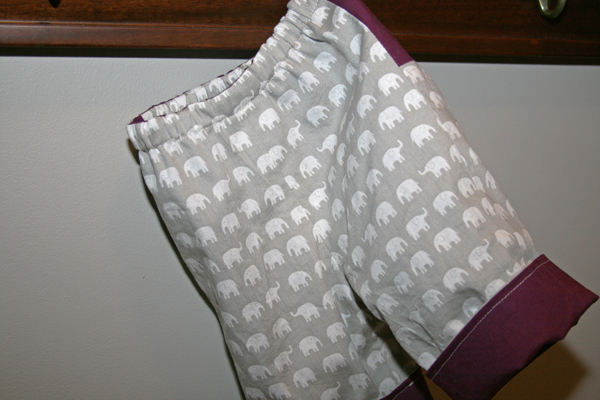 I went with just two fabrics for this pair – the elephants paired with Kona Eggplant, with the reverse for the inside. Now I just can’t wait to see them on the baby! This entry was posted in baby, Clothing and tagged anna maria horner, baby clothes, flea market fancy, handmade, handmade beginnings, lizzy house, pants, quick change trousers, tip top elephants. Bookmark the permalink. They look great! I’ve been eyeing that book for awhile and might just have to get a copy! These are all so adorable. I love your color combinations. Your baby is going to be seriously well-dressed. These are absolutely adorable! 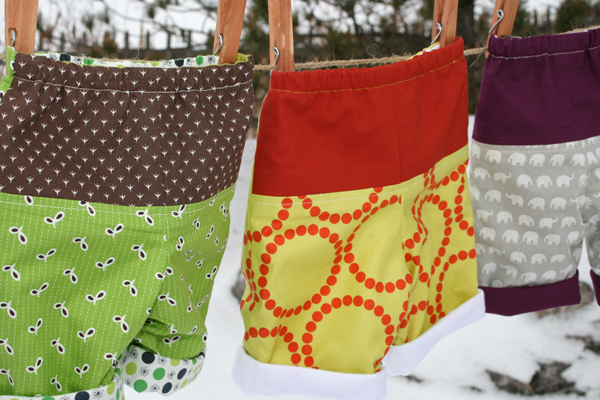 I don’t have a baby on the way, but this makes me want to sew some little pants, too! I love them all! 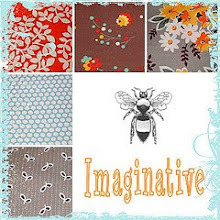 The fabrics you chose area all beautiful. I wish I had a tiny little person to sew a pair for! all are very cute, but go buy yourself some BabyOxy Clean. the hardest moment of my 2 month old daughters life came for me when she exploded on a heather ross bike romper I had made her. the stain never came out. 2 wears was all it got. still makes me ache just thinking about it. Ashley, those are so cute! I’m next on the list for Handmade Beginnings at my local library and I have some of those cute Tip Top elephants sitting on my fabric shelf. I see some baby pants in my future! They’re adorable! I love that pattern – Kit has 2 pair so far and I’m starting a 3rd pair today. I can also highly recommend the Mariposa tunic as a nursing top – just fyi. The pants have a pretty long life because of the cuffs. When you make the 9-12 month size it’ll last for quite a while because they stop growing out and just stretch up. I think Kit will be wearing hers well past 12 months. As for the white flannel, if you keep it on the inside you’ll be just fine. He won’t be crawling yet when he’s wearing those anyway. Also, for stains, if you’re exclusively breastfeeding then any poop stains will come out with plain old sunshine. It’s like magic. Great job! What fun print combos. Oh so cute and I love all your fabric choices! 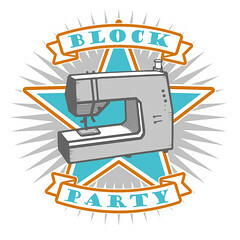 I need to go get that book, I”ve been putting off baby sewing until next month when we have the ultrasound, but after that it’s on! i’ve heard great things about that book and after seeing these pants i may need to pick it up! my baby needs pants! Love! Too bad I don’t have any baby boys to make them for…my baby is almost 5! Those look GREAT! I agree, your little guy definitely needs elephants in his life. What fun – the flannel may not be that practical, but it sure will be cozy!!! Love the shot of them standing all on their own. Cute! Love em! Too bad I don’t have any baby showers to go to in the near future! Adorable – I love this pattern! I have made about 6 pair for gifts & my own boy. I am actually working on enlarging the pattern to fit my older 4yr old son! These are just adorable! Your fabric choices are, as always, outstanding. I look forward to baby arriving and seeing photos wearing these! So cute! Can’t wait to see your little one in a pair of those. I can’t say enough awesome things about this pattern. My daughter has a bunch of pairs, and I also made a few that are not reversible (just the outer layer) for the cooler summer months. Love these! And don’t worry about the white flannel – it’ll be nice and soft. The color combinations are wonderful! I do hope your child is able to wear them and they work out the way you want them to! I say that b/c my first son was 9 1/2 lbs, 22″ long at birth and grew A LOT is first year of life, broad shoulders and all! The only fabrics that could last past a couple of wears were knits! Joann’s can have a nice selection of baby knit fabrics. 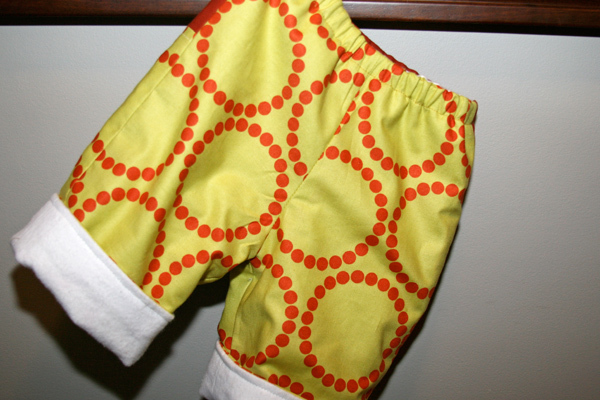 Knit pants are perfect for little ones The “children’s sleepwear” fabrics have to meet the flame retardent laws too. (my 2nd son was 7 1/2 lbs, 20″, and grew very slowly!) So don’t fret! Even if certain things don’t work out with this child (clothing-wise), they always could with the next one! ;o) I also made a bunch of “silky blankies” for my 1st one and he didn’t like them – he liked the crocheted blankets from friends. Thinking the same thing would happen with my 2nd one. I learned how to crochet, made him a few blankets, and he didn’t care for them! He loves all the silky blankies I made for his big brother! I love these! I’ve had my eye on this book, so now I’ll need to move it to the top of my list. As always, your fabric choices are great!